On 26th May CS upgraded Lloyds to Outperform and flagged that sustained low interest rates would allow for a £4bn increase in mortgage revenues over the next three years. Yes, but meanwhile bank stocks fell, in part Euro sovereign debt crisis and otherwise "Basel III" new requirements, though mainly because interbank funding had again dried up, and because central banks are closing (not shutting) their overnight windows. 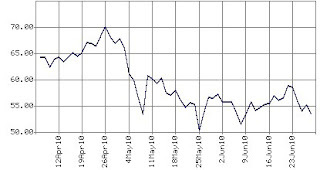 Base rate expectations fell since to record lows, but this coincides with spiking of private sector interbank funding rates to a 9 month high over concerns centred on the ECB's parsimony, withdrawing €450bn (£356bn) support package opened a year back to ease European banks over the financial crisis. This should bring ECB liquidity support back to 2006 level. The spread between the three-month US dollar Libor and the overnight indexed swap rate, commonly used as an indicator of banks’ trust in each other’s credit worthiness, almost trebled since May 1. Overall, Europe’s banks are facing a hit equal to about 10% of 2009 earnings to pay for increased funding costs in 2010, according to Citigroup research issued last week. Higher costs of unsecured funding for 24 European big banks would be c.€15bn ($18bn) this year, or 10% of net earnings last year, because of fears (absurdly exaggerated in my view) about sovereign debt exposure. I assume from this that the 24 banks on average currently need to refinance about €40bn, for which they had been relying on ECB over the past year for something up to half. Europe’s banks are more heavily reliant on wholesale funding over durations of 12 months or less when compared to US or Japanese banks. Bank of England has tasked UK banks with getting longer term funding, but it is unclear what the longer end market looks like. All this bodes badly for governments wishing to disengage from banks this year or next year! 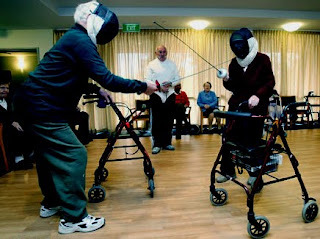 The patients are not yet fit to walk without the central banks Zimmer frames. The image below does not show JC Trichet and A Merkel watching two bankers competing. Banks using central bank facilities at the ECB include UK lenders with branch operations on the continent facing a shortfall up to £100bn when the facility is removed. Spanish lenders are especially upset because they especially have been frozen out (or let's call it blackmailed by uneconomically high funding rates to refinance their funding gaps) of wholesale lending markets in recent weeks. They correctly warn of dangers in withdrawing the support given that the debt crisis is obviously still gripping the €uro Area (EA). Perhaps the ECB is trying to signal its confidence in EU President van Rompuy's hastily cobbled together €720bn stabilisation fund. But all must know that so far this is more back of fag packet agreed blueprint than a financially operational fact. 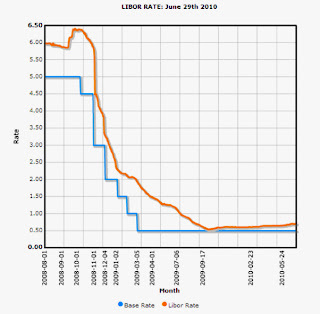 The central interbank base rate of Euribor and Libor may be only 10bp apart and historically low, but this does not mean banks are finding it at all easy to refinance their short and medium term MTN or copvered bond (Pfandbriefe style) borrowings. Three-month euribor rates - a base measure of the rate banks are willing (plus a sovereign risk and bank risk margin) to lend each other are at 76bp, which should rise depending on how much banks borrow from the ECB in three - month loan programme. With high borrowing cost and additional reserve requirements and negative real interest for depositors, the pressures on banks to continue to shrink their lending appears unrelenting? It is not unlike the sore head days of Credit crunch in 2008 when banks refused to pay the rates funding gap finance lenders demanded of them for fear of dissolving their profits only to lose far more in share price collapse and asset write-downs. The banks in their restructuring during the recovery period may simply have to accept loan losses for a year or two in corporate lending especially. But unless there is some government involvement and agreement among leading banks to do this, they will be punished by investment analysts; they are between the dogs and he fire hydrant. CS considers the risk of liquidity regulation and bank taxes has eased as banks won longer time to implement new higher reserve requirements. CS expects a 5 year adjustment period, which is rather long in my view, too long for Euro Area banks before they are in their next bout of full-blown recession? In the UK, funding is a central difficulty for the banks. 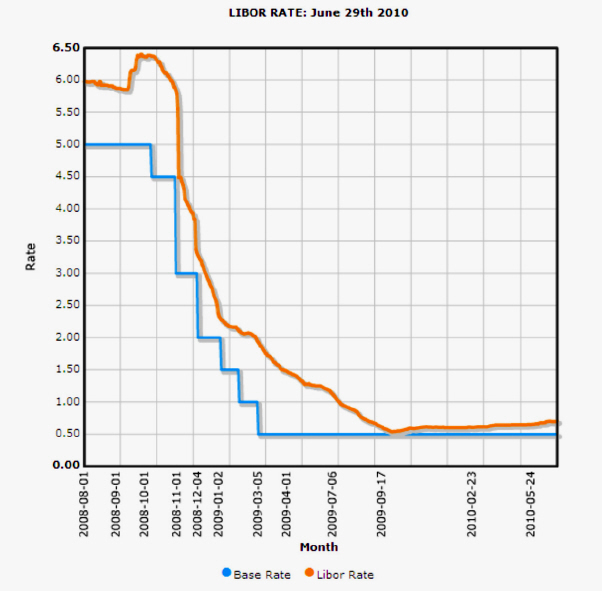 They got over £400bn assets off the books, but central bank asset swaps (BoE's SLS & APS) and credit (depositor) guarantee (CGS) cost just over double Libor (85bps over LIBOR), which is therefore where they would like wholesale funding costs to be. For that it would help if UK sovereign ratings are lower, and that in turn would be helped if UK's external accounts improve. CS, like others, assume that when SLS and APS repo swaps are ended (sometime in next 2-3 years) the replacement cost should be far lower than additional mortgage net interest profits. How it works is not quite like that. The banks did not receive funding when they repo swap 'sold' their £470bn assets (£185bn + £285bn) which mainly helped to halve UK banks' total funding gap as well as generate preference shares in place of arrangement fees; they received treasury bills and a BoE cheque, which are not meant to be encashable. These can be swapped back. The banks then need to internally or externally fund the gap at the time on the liabilities side of the balance sheet and provide capital reserves to support the assets (depleted by probably 25% amortisation) i.e. £300bn, RWA £150bn = £12bn regulatory capital plus £5bn economic capital buffer = £17bn. We might assume half of this is fundable from retained net interest income profits internally generated capital) and half from own portfolio investments. Funding gap financing may then increase by a third (based on today's numbers) and hopefully the cost of this will be economic for the banks with respect to corporate lending margins especially i.e. well within them? LBG averred from APS but must have about £70bn of the SLS assets (my guess, of which £55bn is HBoS legacy). On unravelling the swap repo this may be closer to £50bn for which liabilities need to bulk up. Following September 2008, central banks expanded their balance sheets to save the banks (and underlying economies) from blackmail by private lenders. Blackmail may be too strong a word since private funding sources discovered they had problems too in maintaining their leverage. It was all somewhat circular; left and right hand confusion. The question for the sovereign debt crisis has to include asking whether ECB did enough. Most would answer a strong no, and certyainly it seemed foot-dragging compared to US and UK central banks. As central banks seek to shrink their balance sheets back down again, alongside governments shrinking their budget deficits, balance sheet shrinkage by commercial banks is likely to have to continue! This could be a deflationary catastrophe. It is only relatively the case 9against a negative trend) that this 'deleveraging; by commericial banks may be less severe with looser liquidity regulation. Mortgage lenders are worried however about their ability to refloat the mortgage market. LBG is the biggest. And as the biggest in UK domestic banking we might see LBG as a bell-weather for the sector. CS say that lower CPR rates in the mortgage portfolio point to slower balance sheet reduction at LBG. While this is unhelpful for the long-term funding structure of the bank, it should assist medium term profits. CS now see "9% growth in pre-provision profits in 2009-2012 from a combination of passive mortgage spread widening combined with cost savings provides transparent pre-provision profit growth. Securitisation data also points to stable mortgage arrears and declining unsecured and corporate NPL in the UK." CS think it is too early to reduce impairment forecasts but this is encouraging. CS also say that "Normalised ROTE could look good in the medium-term: Despite an equity tier 1 ratio of 11% in 2012, we believe the group could generate ROTE of 15% in that year assuming a normalised 70bps impairment charge." CS's valuation upside: "In the long-term and as a function of higher base rate eroding mortgage margins (more than offsetting additional deposit revenues) we don’t think this level of ROTE is sustainable. But such a scenario is now 3-4 years away. 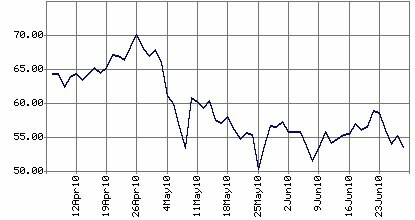 In our valuation, we apply a small premium to TNAV and after adjusting for the unrecognised pension fund deficit we arrive at a 12-month target price of 68p (versus 60p before)." It seems obvious however that bank shares remain volatile, subjected to short term broker-dealer profit-taking, other short term traders and shorters, and hedge fund macro-strategies. Much will change in the medium term, not least resulting from the government's banking Commission looking at break-up of the big banks - more on this later.